Synchronize files between Mac and FTP servers. Is there a better alternative to Favorite FTP? Is Favorite FTP really the best app in FTP category? Will Favorite FTP work good on macOS 10.13.4? 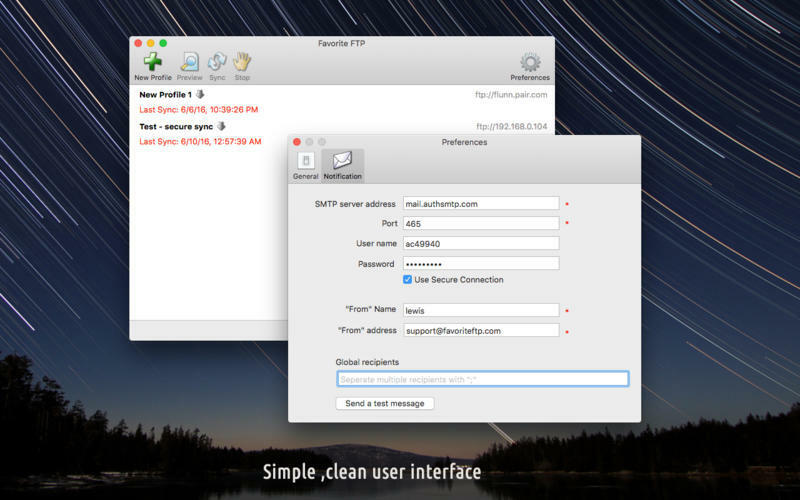 FavoriteFTP is a product to help you synchronize files between Mac and FTP servers. Do you still need to manually upload files you just edited? Do you still need to pickup files in different directories in order to upload them? Do you still need to check every directories in FTP server to download files your partners just updated? Please, leave it to FavoriteFTP. It detects new and changed files on Mac and FTP server, then synchronizes them automatically. All you need to do is a button click. Only changed files will be synchronized! Favorite FTP needs a review. Be the first to review this app and get the discussion started! Favorite FTP needs a rating. Be the first to rate this app and get the discussion started! Unlike other software which copy all files every time, even if they are not changed. Favorite FTP synchronizes changed files only. It'll save a lot of bandwidth, and more important, your precious time. Sync files automatically without user interaction and receive email notification when it's completed. You can use built-in scheduler or any other scheduler program to automate FTP sync. Secure SSL and SFTP connection ensures nobody can see your data during transfer. Favorite FTP can verify (CRC, MD5 or SHA1) the files after sync to make sure they were synchronized 100% correctly. Uploading/downloading multiple files with different servers at the same time. 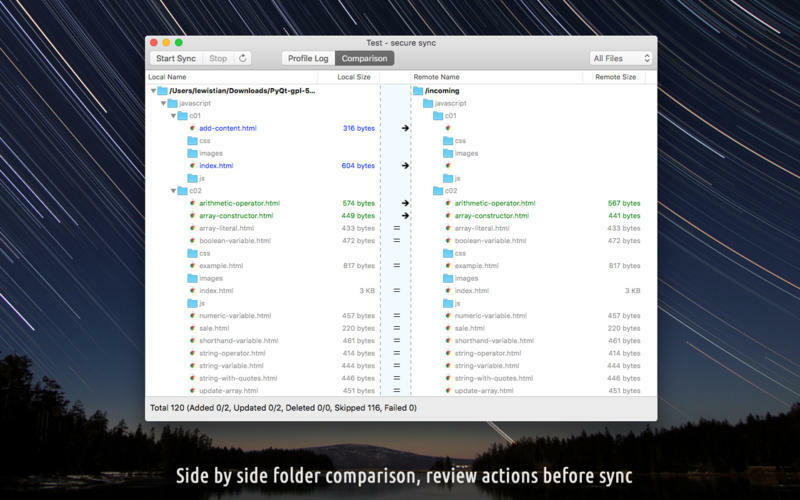 Synchronize files correctly even if the time zone between Mac and FTP server is different. How about if you modified a same file in both Mac and remote computer? Most software can NOT handle this, they simply overwrite older files by newer. Please, don't do this! Favorite FTP takes care this situation. You can ensure your files will not be overwritten by mistakes! SOCKS4, SOCKS5, HTTP Proxy, Simply Relay, SOCKS4A, SITE hostname, OPEN hostname, USER user@host, etc.